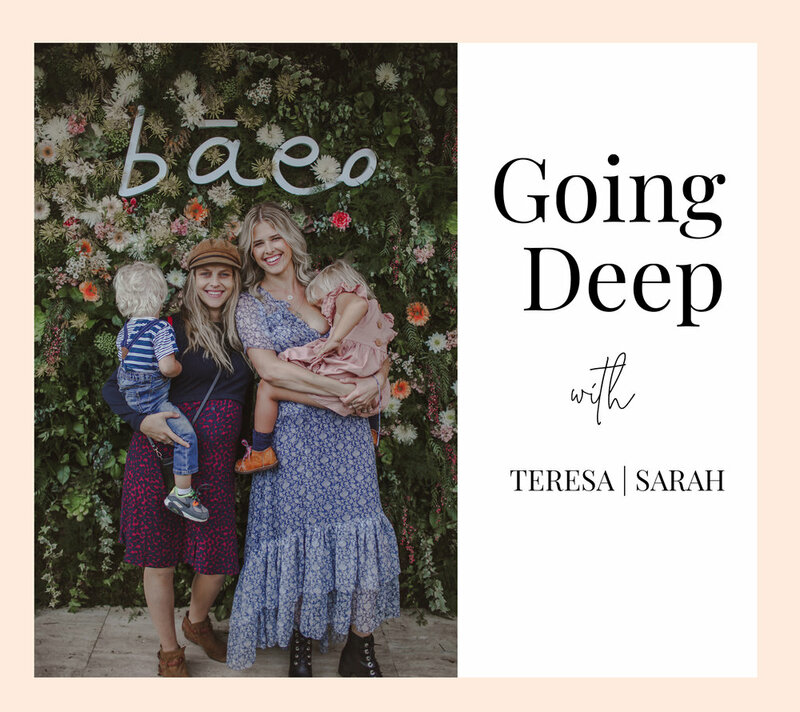 In this month's Going Deep, Sarah and Teresa answer your questions about feeling lonely as a mom, germs and how to not become Howard Hughes, hair products, practical vegan meals and snacks, how your partner can help during labor, delivery, and post partum, and their respective journeys into the world of acting. We love connecting with you all, getting your feedback and questions, so please keeping sending your questions to us here! It has been my deepest desire to become an actress for so long and before I’m making my journey out to LA, I’m hoping you can each tell me about your journey and what it was like starting out/how you started and got your foot in the door. I want so badly to be able to provide for my mom as well as to contribute to the art that is produced in the world. I’d love and appreciate some detail from you very much! SWO: Hi Grace thank you for writing in. I came over from Kentucky to California. I started off as a model when I was in high school. I did local theater and school plays, but I auditioned for model searches and was connected with an agency that later led me to work in Chicago. I had an amazing agency there that connected me with a commercial agent. I did some commercials and auditioned for a few different shows, and I ended up booking one that brought me out to Los Angeles when I was 19 years old. Every journey to get here and to work out here is different. I am not sure there is any special method to make it all happen. Some people take acting classes or go to a proper acting school. Some start off by submitting for commercials and trying to get into the union that way. Acting classes are so helpful to build a community of friends and to work on material that keeps you fresh and excited as you are looking for work. You may not like the first class you go to, so find one that feels right and works for you. I do think it is a helpful way to find friends out here and learn from your peers. I wish you all the best! I was wondering if you could talk about how your husbands helped you during your labour & delivery, and what advice you would give to an expectant dad about how to support his partner during the birth and post-partum? SWO: Hi Hannah, I love this question. Reading your question made me smile because it reminded me of my husband and I trying to learn all we could when we were pregnant with our first. I think making your partner as much a part of the process as possible is so important. I loved reading Ina May’s guide to childbirth and when I read a birth story that I loved I would bookmark it and have my husband read it. When I saw a birth video that I loved I sent it on to him. We watched The Business of Being Born together and had major convictions about how we wanted to approach birth after seeing it. He came to as many doctor appointments as he could, and in LA we have a place called The Pump Station where you can take classes. My husband came with me to a breastfeeding class and learned how he could help me during this process. During the actual labor, I felt my husband was my rock because of how much we had discussed. I held onto him for dear life, literally. He learned a lot from my doula about ways he could help during labor. Everyone’s experience is SO different so it really depends on what you want and need from your partner. As you learn more during this process just make sure you communicate with him so you are both on the same page. By the time we had baby number two, my husband had two jobs: to be my rock, AND to protect me from tearing! He was on coconut oil duty and he took that job very seriously. During the pushing process he poured probably a gallon of coconut oil on my perineum and I had an 11 pound baby girl and did not tear at all! getting the cold scented flannels and giving them to me. Figure out your list and let that guide his way! Hi, I am from Germany and I am thinking about changing my food lifestyle. I know Teresa is vegan, but what does it mean to you and what are you eating all day long? Main meals, snacks, afternoon tea? What stuff you give your kids to eat? What you are having instead of unhealthy stuff like chocolate or chips and french fries? TP: Hi! I’m usually vegan but I’m vegetarian during this pregnancy, my kids and husband are all vegan though. We always try to ensure our kids are getting enough protein and all the nutrients they need. Often times we will have a big smoothie in the morning with almond butter, pea or hemp protein, bananas, crushed ice, cinnamon and almond milk or oatmeal. For lunch, it’s usually a vegan cheese and plant based sausage quesadilla or beans, rice and avocado. For dinner, it’s eggplant parmigiana, a big pasta with some vegan protein meat and a bunch of veggies or a yummy pizza with a heaping veggies and vegan cheese. Snacks are popcorn, vegan rice crispies made from veggies, veggie/fruit squeezies, Mary’s Gone Crackers (made with lots of great seeds so they’re high in protein) and hummus and veggies. We are very flexible and find we can eat anywhere these days as a vegan family and make sure all our nutritional needs are met. More and more people are moving towards a plant based diet, it’s so wonderful to see how happy and healthy people are feeling with this lifestyle change. an egg and avocado toast with “everything but the bagel” seasoning. oatmeal with flax and chia seeds drizzled in honey with fresh organic fruit on top. you can always add in red and yellow peppers while cooking the potatoes to add some more flavor. LOVE a garlic hummus or Raw garlic dip to eat with this. What products (shampoo etc) do you use to keep your hair looking so awesome? What do you ask for when you gets it colored and how often does she get it colored and cut? I use the moisturizing one and it has been by far my most favorite. I get a highlight and a cut every 3-4 months or so. I just ask to be brightened up a bit and in terms of a hair cut I just ask for a shape up. If you trust and have seen great work from the colorist you use, then you can work with them to get the color you want. TP: I like a very low maintenance hair style! So I only see my hair stylist Tracy Cunningham once a year and ask her to put the kind of highlights in that means I don’t have to come back for a touch up for a year! I like keeping my roots my natural colour and just adding some sun kissed pieces around my face. My hair is naturally wavy with a very beachy texture. That means it can get knotty if I’m not properly looking after it. I was over the moon to discover the ethical, good for the planet, gives to charity, not tested on animals haircare brand, Alba. The smell is amazing, it’s affordable and easy to find, and the conditioner is so potent that I don’t need to use half a bottle per wash. My hair is left feeling soft, completely replenished and like I’ve slept with my hair cling-wrapped in coconut oil (which I’ve also done before). It is truly a deep treatment for your hair. Since the birth of our first child, my husband and I have become overly obsessive over germs and our kids not getting sick. I feel it’s gotten to the point where we don’t like to interact with other kids as much or take our kids to playgrounds with fear of them getting sick for the next two weeks just from a twenty minute play. We both know it sounds ridiculous, but can’t seem to break it and we both feed off each other. I never used to be like this and didn’t grow up this way. My husband has always been a germaphobe and has passed this on to me. I feel like I’ve picked it up from him as he reacts so badly when the kids are sick. I feel under extra pressure for them to not get sick as I’m worried his reaction is so dramatic. I feel like we are damaging our eldest who is 4 over constant hand washing and telling him to not touch this, don’t touch that, etc . I’m wondering if we can ever break this crazy cycle we have started for our family! TP: I totally empathise with what’s going on over there in your household, but truth be told it may induce stress in your children by being overly anxious surrounding their health. Kids get sick. It’s just the reality of having children, but the good news is that getting sick means at least their immune systems are strengthening. I know how much we want to protect our children, but sometimes if we become too overprotective it ends up affecting our children negatively. Talk to your husband about it and some of the things that might potentially show up if you continue this kind of focused attention. Come up with some non negotiables together. For example; keep the kids away from other children with gastro (the flu) or kids that have fevers, but let them interact with other kids that have sniffly noses (just wash hands after any interactions). The fact that you’re reaching out with this questions tells me that you intuitively know there’s another way, be open with your feelings and make some positive changes so that you find a happy medium. SWO: I’m wondering if your little one is in preschool yet. I think there is a happy medium for sure. My husband and I are pretty big on hand washing. We wipe down airplane seats and trays and when another kid is sick, we just wash hands after and remind our child to not eat or drink after them. If you are feeling this way and it feels stressful, your child is probably feeling this energy too. I think it’s totally ok to make hand washing a very normal part of life. Meaning, you talk about why it’s important to wash hands and stay healthy in the same way you talk about eating healthy foods and brushing your teeth. It’s good for children to get colds. I use to worry about this too, but it builds their immune system. It makes them stronger for when they are older. Exposure to germs at preschool when you don’t have control over what they touch or put in their mouths is actually good for them. When my little guy gets home from school, we change clothes and wash hands. It’s just a part of our routine. You just don’t want to make a big deal out of it, so it doesn’t scare your little one. You don’t want them to sit around worrying about germs. I would suggest having a conversation with your husband and if you like your pediatrician him/her too. Discuss a new way to approach this where it isn’t stressful or scary. Make sure he understands that his reactions will have an effect on your little one. Have your pediatrician explain to your husband why it’s important for kids to get sick (7 colds a year) I think is what they say is pretty average. Your husband can go to a check up with you and you can ask the questions. “Doctor, it really freaks me out when my kid gets sick, should we be sanitizing every 20 mins to make sure our child stays healthy?” You already know the answer to this but it will be good for your husband to hear it. This way our husband hears all the answers from the doctor and you get reassurance and also an entry into a discussion about your new plan and approach for this. My son is now in his third year of preschool and at the beginning he got sick so much. It felt like every week he came home with something new. This year I really feel his immune system is so much stronger. SWO: Ivana this makes me want to come over for a play date so bad. YES! You are not alone. Motherhood can totally feel lonely sometimes. Especially in the first year. I always felt I spent so much time slipping away to nurse my baby, and in this time, although it was beautiful with my baby, it was also lonely for me. I missed adult connection and conversation. I felt left out at dinner when we would be with friends and I would have to go outside to rock the baby. TP: Oh there’s nothing more isolating than doing the mummy thing on your own without friends and family near by. I feel you mama. I suggest finding your community by participating in activities like prenatal yoga or joining a mummy and baby group, heading to the park and chatting with other mamas that you meet. I’ve made so many friends through my Mummy and me group. It’s nice to do these activities with your baby because you’re going to meet other people in the same situation as you, navigating the parenting journey! Otherwise, another thing I’d suggest is getting a sitter a few times per week and doing things for yourself, whatever speaks to you and helps build your tribe.